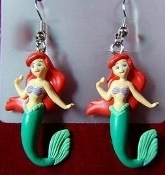 Mini DISNEY PRINCESS EARRINGS - The LITTLE MERMAID - Animated Movie Cartoon Character Costume Jewelry - ARIEL - Classic Miniature 3-dimensional plastic toy charms ornaments, each approx. 1-3/8-inch (3.44cm) tall. Every creature under the sea wants these!